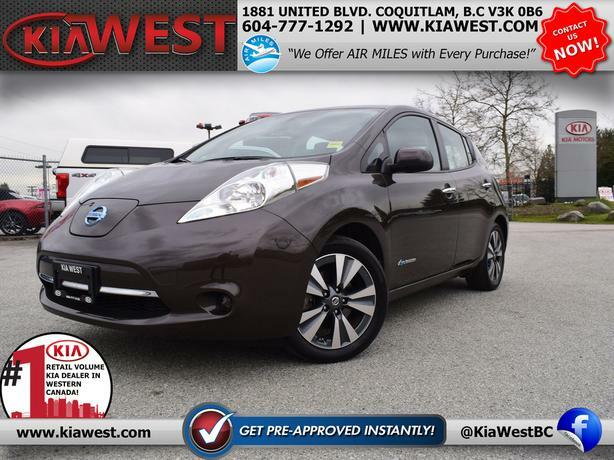  Log In needed 2016 Nissan LEAF SV FULLY ELECTRIC! We are Canada's #1 KIA Retail Volume Dealer. Our volume purchasing power saves you money! Our motto "we can replace vehicles, we cannot replace our customers!" is the reason we sell more new Kia's than any other dealer in Canada! 2016 Nissan LEAF SV FULLY ELECTRIC! All of our vehicles come fully inspected and a Carproof is provided for your own peace of mind! WE ARE THE ONLY KIA DEALERSHIP THAT EXCLUSIVELY OFFERS AIR MILES WITH EVERY PURCHASE! Call or text 604-777-1292 for promotional pricing! OPEN 7 DAYS A WEEK WITH OVER 600 VEHICLES TO CHOOSE FROM! Need to finance? Not a problem. At KIA West we finance anyone! Good credit, bad credit or even no credit. We also offer in-house leasing so you can build your credit and get approved at a lower rate and for a longer term. Call today to get APPROVED! No matter what your financial situation, we will have you leave our lot in a new vehicle today! KIA West is a family owned and operated dealership with core values of honesty and integrity. Full of friendly and knowledgeable staff that work for you day and night to ensure you are happy before, during and after your purchase.